In early 2011, when the Steenbok Channel was clothed in a luxuriant and healthy eelgrass bed, Richard Barnes investigated its invertebrate fauna at a series of nine points (at Kingfisher Creek near its junction with the Ashmead Channel, at its head near the Armstrong Causeway, and at a point halfway between the two, adjacent to the Reserve’s Indigenous Garden; and at three points down the shore at each of those three sites – low water neap, mean low water, and low water spring). Early this year, he sampled those same nine points again but in 2018 in areas of bare mud left after loss of the seagrass. This was a race against time before the bare mud itself disappeared under the seasonal return of the ‘green plague’. Each point was sampled using 30 replicate core samples in three blocks of ten, just as in 2011. 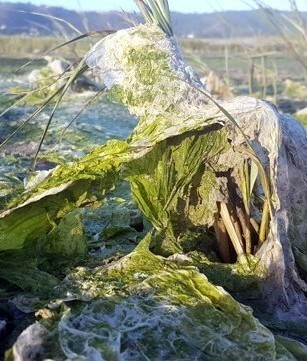 The nuisance algae, Ulva lactuca, has been invading the Knysna estuary for the past few years. At each of the nine points: the number of species present was significantly less in 2018 than in 2011 (in an overall ratio of 1 : 0.61), as was the species diversity and taxonomic diversity (the range of different major types of animal present); but the number of individual animals present was considerably greater in 2018 (in a ratio of (0.62 : 1). The nine points were also more similar to each other than had been the case in 2011, i.e. the fauna was more uniform along the Channel (in a ratio of 1 : 1.30). The composition of the fauna had changed too. In 2011, worms comprised about 50% of the individual animals present, in 2018 they comprised >90%, increasing from 3,000 m-2 to 9,000 m-2; in 2011, small crustaceans – amphipods, isopods and crabs – were present in densities of >1000 m-2 but had fallen to <120 m-2 in 2018, whilst over the same interval small gastropods had crashed from >1000 m-2 down to <10 m-2. It appears that numbers of the small gastropods, species masquerading under the temporary names of ‘Hydrobia‘ and ‘Assiminea‘, have plummeted over quite a wide area including within the surviving seagrass beds, and their decline may have nothing to do with the green tide. As far as the worms and crustaceans are concerned, however, their changing fortunes do seem to be related to the change from seagrass to bare sediment. It so happened that in 2014 Richard had a pair of sites in the central region of the Steenbok Channel at low water spring, one with seagrass and the other not (i.e. a naturally bare site pre-dating the green tide). The 2018 post-green-tide bare site and the earlier (2014) ‘naturally’ bare site did not differ in their biodiversity (although numbers were up in 2018 relative to 2014). Numbers of animals in a former seagrass but now bare site might be expected to be high because of the fine organic-rich sediment accumulated by the seagrass that still persists in the form of mud although the seagrass itself has died. But the equivalent biodiversities supported by the 2018 post-green-tide site and the earlier 2014 one, and the considerable similarities in their faunal composition, suggest that what has happened on loss of the Steenbok seagrass is that the fauna has reverted to what is naturally present in adjacent non-vegetated areas. There has been no ‘degeneration’ to some ‘degraded’ state, just a change to what would have been there anyway had the seagrass not been present. Local bare sediment is naturally very rich in worms but poor in most small crustaceans. This, however, could well affect the young fish that use the area as a nursery and feeding ground because few if any of them feed on worms whereas those taking animal prey mostly take small crustaceans. They will certainly have difficulty finding sufficient food.